Separated, Divorce, Relationship no longer exists Line: horizontal line connecting 2 symbols with 2 diagonal hash marks. 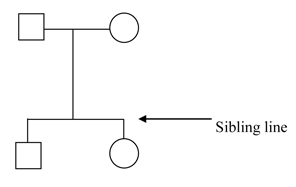 Offspring Line: Vertical line from the center of the mating line to the center of the offspring symbol or to the sibling line. Children from a previous partner (stepchildren). 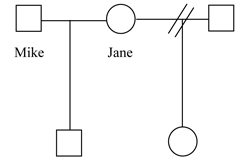 Mike and Jane have one son, and Jane has a daughter from a previous marriage. Sibling Line: Horizontal line above the offspring and connected by vertical lines. Example: brother and sister siblings. Dizygotic Twins (non-identical) : Indicated by two diagonal vertical lines originating from the same point. Monozygotic twins (identical): Indicated by two diagonal vertical lines originating from the same point. No children: A vertical line with 2 hash marks at the end. Indicate if an adult does not have children by choice (c), infertility (i).